When planning an openhole sidetrack there are a number of choices to be made which will affect the ease and speed at which the sidetrack will be initiated. The easiest orientation to choose is to exit from the low-side of the wellbore as this allows the maximum weight from the BHA and toolstring to assist in the bit’s side cutting. Additionally, the more deviated the wellbore is at the sidetrack point, the more that weight will help. Choosing a high AKO setting for the bent housing motor will increase side-cutting to further aid exit from the moterbore, however the intended sidetrack may require a lower AKO setting so there is a trade-off between sidetrack speed and the need for an extra trip to adjust the bend in this case. Particularly when using low AKO settings it helps if there is a dogleg in the opposite direction at the sidetrack point. It is also important to calculate the length of time-drilled sidetrack that will be required for the entire bit to exit the motherbore, and to add a suitable safety factor to this to account for differences in dogleg and to make sure that full WOB is not applied too soon, breaking the ‘ledge’ and putting you back hours in operational time. General guidelines relating to the best practises in time-drilling an openhole sidetrack from a deviated wellbore have existed for a long time and differ very little from source to source. With these as a guideline, the real-time data available from e-coil conveyed drilling assemblies, in addition to the accuracy of electric-drive CT injectors, removes a lot of the guesswork from the process and allows for a faster, more reliable sidetrack initiation. While creating the initial trough for the sidetrack, realtime WOB allows for CT stretch to be accounted for by locating the zero point between compression and tension. 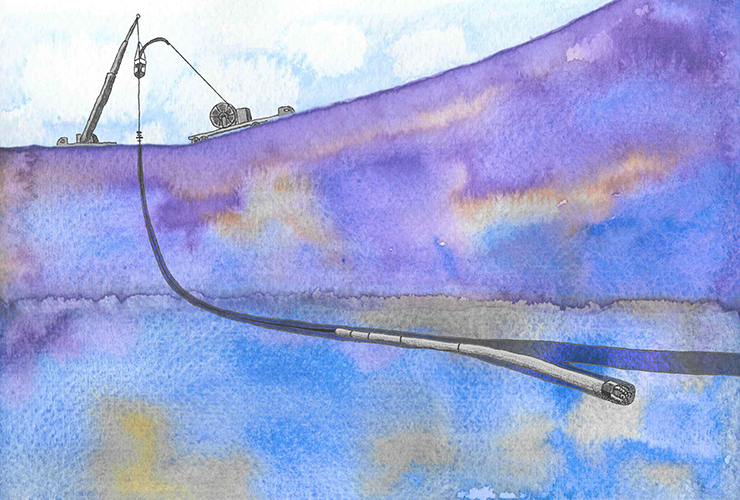 This makes it easier to create a good quality starting ‘ledge’ at the downhole end of the trough. When continuing with time-drilling the sidetrack it is easy to see the bit cutting by observing the WOB and torque slowly reduce while lateral vibration slowly increases. This, coupled with the small adjustment capability of an electric-drive injector means that the bit can be advanced as required rather than basing it on timing alone; it also has the extra safety of not over-shooting the advancement interval.